Oh, sorry, I thoght you could fill it with air, even thought it is ment for CO2. Bad idea because you're not going to find a paintball shop stupid enough to try it. It would violate the regulations of their license. You should never fill a tank with something it's not designed to hold, nor should you fill to levels beyond what it's rated for. Edited by CaptainSlug, 31 May 2007 - 04:01 PM. Firstly, I would like to applaud your ingenuity. As others have said, this is truly amazing. Otherwise, I also had a question about those push-button valves that you used. Are they such that they could be used as the valve that fires a homemade, or is the speed of the air output just way too slow for such an application? The push-button valves have too low of a flow rate to be used as a trigger valve. Which is why I've been designing some homemade valves. I just read it thouroughly for the first time, and I, as everyone who sees this, am truly astounded by the beastliness of this. If I can every come up with a primary which uses are, or has something on it that uses air, I will think about spending the money on getting one of these. As it is, though, all my favorite primaries are centered around springs. If you need to refill your gun, you simply push the push-button valve connected to the low pressure airtank. If you need to refill the low pressure airtank, do you push the push-button valve connecting the low pressure and HPA airtanks? If I am geteting this straight, do you only have ot carry your DIY tank during a round at a war? Or do you carry the paintball tank too? In the first part of your first post, you said that one should not use this system when using a gun that uses a bladder, such as the PC, Magstrike, ro rf20. But then you are using your MagStrike 20 in the video (which is very nice), did you replace the bladder with a "rigid chamber", or whatever you called it? If so, what was it? The DIY tank doesn't look that big, now that I see it in a video (unless you are very tall). I think I might make one of those this Summer. It wouldn't serve much use presently, though, unless I go to some of the wars in Melrose. Again, that is fantastic. Great job. 1. If you need to refill your gun, you simply push the push-button valve connected to the low pressure airtank. 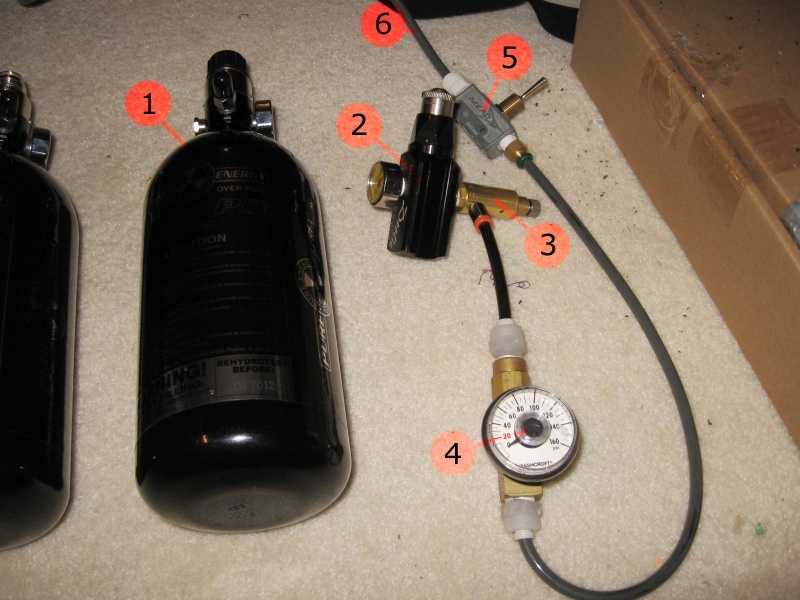 If you need to refill the low pressure airtank, do you push the push-button valve connecting the low pressure and HPA airtanks? 2. If I am geteting this straight, do you only have ot carry your DIY tank during a round at a war? Or do you carry the paintball tank too? 3. In the first part of your first post, you said that one should not use this system when using a gun that uses a bladder, such as the PC, Magstrike, ro rf20. But then you are using your MagStrike 20 in the video (which is very nice), did you replace the bladder with a "rigid chamber", or whatever you called it? If so, what was it? 2. I have the option of either. I can carry the paintball tank and the low pressure tank so that I can refill the low pressure tank in the middle of a round. Or if the paintball tank is empty I can just refill the low pressure tank with a bike pump then disconnect that and play a round with just the low pressure tank. 3. The low pressure tank can output at levels that the bladder cannot hold unless heavily modified. The low pressure tank when hooked up to these guns acts as a complete replacement for the bladder because it hooks up directly to the trigger valve in the gun. However, you could setup the low pressure tank so that it is used to refill the bladder in the gun via a push-button valve like you would with a single fire gun. This would allow you to use them as standalone weapons later. Edited by CaptainSlug, 10 June 2007 - 07:17 PM. So did you hook the low pressure tank directly to the Magstrike piston? No OfAll, because if he did, there would be no trigger mechanism to control the firing. He had to hook it up to the tubes where the bladder used to be. how the heck do you make a double clip? 3. Search double longshot clip. i dont have time, jeez, im new here! The lack of opening up my Magstrike probably contributed to my question. CaptainSlug also has a really nice writeup of how he attached the tank to the gun.... but you actually have to look for it. Edited by Prometheus, 11 June 2007 - 07:56 PM. I didn't really go into detail. I need to take an internal photo, but it's really simple. All you do is chop off the tubing near the bladder and replace it with a straight coupler. 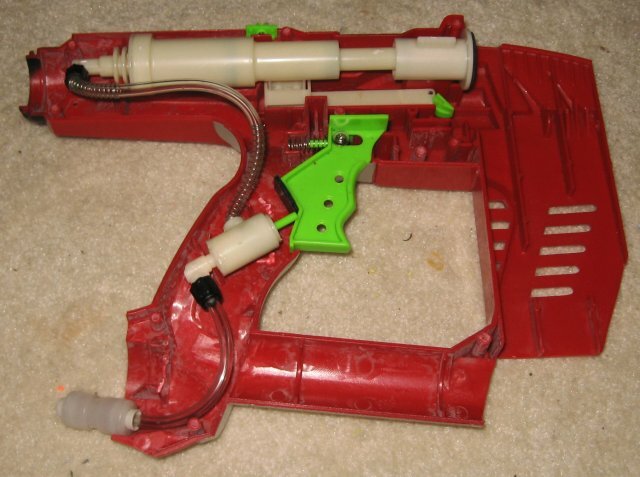 Edit: Here's what the inside of my tank-ready magstrike looks like. I will be updating the main article with a new schematic option for hooking up a paintball tank directly to air powered new guns. But that will have to wait until I can obtain a new inline regulator. Edited by CaptainSlug, 18 June 2007 - 04:45 PM. First post updated with a new part configuration that's much simpler and has fewer parts. Edited by CaptainSlug, 19 January 2008 - 07:59 PM. First I'd like to thank CaptainSlug for making this guide. It saved me a lot of time to say it in short. There's one problem with the guide though. The first regulator noted here can't be bought any longer. Centerflag Paintball Products has essentially ceased to exist. Two weeks ago I ordered a regulator, and after emails, phone calls, and online research, it doesn't seem that Centerflag exists any longer. The phone number given on the order confirmation goes to some foreign guy who has never heard of Centerflag. The phone number on their whois doesn't work. I did find a phone number for one of their employees and I left a message, but I'm still waiting for a call back. Luckily I used PayPal and am working to get my money back. I'm still researching regulators but I'm leaning towards a Palmer Stabilizer at the moment. I'll update everyone when I do buy a regulator and get the system working. I'm also interested in making one of these set ups and with the loss of the centerflag regulators, I would love to know of a new regulator I can purchase. Or even just a new reliable source of the Doolie regulator. The alternate setup is bulky, but works. The Inline regulator has to be able to adjust below the input maximum for the scientific regulator (Clippard MAR-1P maximum is 300psi). I'll try to get an example photo up some time before the weekend. Edited by CaptainSlug, 01 July 2008 - 10:39 PM. The Palmer Stabilizer regulator I linked to should be better than the Doolie regulator. The Stabilizer can regulate down to 0 PSI so you won't need a second regulator unless the Stabilizer is inconsistent (I doubt it is). The inline regulators should work too but as CaptainSlug said, it's bulkier. If that setup is cheaper I might consider it though. After some digging I think I'm on the right track. I've found a former employee who's emailed the owner of CenterFlag at his personal email address so I might be able to get through now. With that being said I doubt these regulators are still being produced. Likely I'll get my money back and that'll be it. I know this topic is a little old and I don't really have anything new to add but I was mainly wondering if CS forgot to post the pictures of his old set up here. Secondly i was also wondering if Doom made any head way on his regulator troubles. I am looking to start gathering the parts for this set up and i could use a little feedback. PayPal eventually gave me all my money back so it worked out fine. I've been waiting for CS to post about his inline setup to see if it'll save money. If not I'm just going to use a female Palmer Stabilizer with a low pressure kit. If I don't get a response in the next day I'll order it. Edit: I bought the Palmer Stabilizer anyway. It came out to $140 with the low pressure kit, mounting plate and an 1/8 inch NPT tube that I couldn't find on McMaster-Carr, which is pretty damned expensive but I figure if it works I'll take it. I'll keep everyone updated on how well this works for me. I'm working on a Nerf gun at the moment and might have something finished in the next few weeks. Edit again: What I'm going to do follows the UberSoaker water gun. I didn't realize it at first but I basically bought the exact same parts. Edited by Doom, 17 July 2008 - 03:25 PM. Thanks for the update. I'll eventually need to build an HPA tank if I ever get around to actually building one of my semi/ full auto designs. Hm. $140 for just a regulator seems a bit steep to me, because I would still have to buy an HPA tank which appear to be around 80+ dollars. I was hoping to get this set up bit for under 200. BUT i guess if this set up works I may have to look into it. About $50 of that was optional parts and $9 was shipping. If you just want the regulator it'll be $79 before shipping. The mounting bracket I got with it was about $30 alone. Perhaps I shouldn't have got it, but it looked perfect and there's no going back now. I'd suggest at least the $79 regulator I got with the $10 low pressure upgrade so you can't regulate higher than 250 PSI. $79 is much better. What was the shipping like for your order i know you had extra stuff but just curious. Thirdly 250psi is more then enough. I assume its 0-250psi? and how accurate/consistent is the regulator? I already said $9 was the shipping. I don't have it yet so I don't know how consistent it is, but I imagine with the optional low pressure spring it would be more consistent because there's a smaller range to regulate to. I have two low pressure regulators so if it's inconsistent I don't have to buy anything. I'll let you guys know how consistent it is after getting it and fooling around for a bit. Edited by Doom, 18 July 2008 - 06:36 AM. I know this topic is a little old and I don't really have anything new to add but I was mainly wondering if CS forgot to post the pictures of his old set up here. My "old" setup was used to fill a low pressure tank and was extremely inefficient. I've been waiting for CS to post about his inline setup to see if it'll save money. I know the cheap inline setup will work and I have most of the parts for it, but I haven't had time to setup or test it. I don't see the point of using a more stable and more expensive inline regulator when you can just add a scientific nonrelieving regulator that will give you much finer adjustments anyways. REALLY cheap inline regulators will work just fine so long as their output adjustment goes low enough to be under the maximum input of the secondary regulator. Edited by CaptainSlug, 18 July 2008 - 02:34 PM. Ok, I have a question, my mom just bought an electric pump, it works on bikes, as well as cars...there is a gauge to show how much PSI is currently in the object it's pumping with about a 250PSI maximum, it was bought for $30. It is charged via eletric outlet and there is about a 2' hose that comes out of the front. My question is, (if I were able to...without both my parents killing me for doing it) do you think it would be a good idea...or even possible to hook it up to a Titan, (via gauge). I've done this before with a bike pump and it was very successful, but sadly, the bike pump didn't have a gauge and I pumped it 15-20 times and the compresser blew up. EDIT: I don't really understand the (indent)(/indent) thing to make paragraphs (i'm not sure if these are what the paragraphs on the site are supposed to look like because i'm used to the format of [tab] then when the paragraph is done, [enter] but this (indent)(/indent) is confusing me, so can anyone PM me or post to tell how this works please? Thanks for your time! Edited by Watari, 24 July 2008 - 08:49 PM. Well, this definitely is a concept...and yes...if you put compressed air into the Titan's air tank and pull the trigger, the air will rush out propelling forward whatever is in its path...That's how a NERF gun works. Yes, your electric inflator is capable of filling a Titan's air tank. The best way to connect the inflator to the Titan is to connect a quick-fit or instant-fit or quick release or whatever they're called connector to the Titan (and yes you can use the tubing that leads to the air gauge, but if you want to ever use the Titan while it's not attached to the inflator, you'll need a check valve) and to connect the tubing to the inflator you should use a bike tire valve...just search around the site, there are many examples. As to whether or not this is a good idea, that depends on a lot of things. It's not easy to carry around an inflator and a titan at a NERF war, so it's not very functional. But as far as pressure goes, 40 psi is enough and 60 psi is probably too much. I wouldn't bring it up to 55 psi. Keep it between 40-45 psi and you'll be fine. Do it if you feel like messing around, but don't expect it to be effective in a NERF war.